Has your club’s Laser fleet declined or not seen any significant growth in recent years? 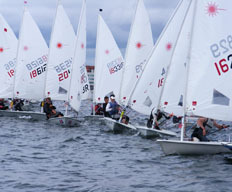 The Laser dinghy is the most successful adult and youth racing dinghy in the world. However, participation has been falling with an increasing number of abandoned and unused Lasers to be found in many dinghy parks. Welsh Sailing, the UK Laser Association and LaserPerformance, supported by Sport Wales have teamed up to help support clubs in activating their Laser fleet. A day including shore and water based workshops, to develop and share ideas on activating your Laser fleet, for the clubs Laser Fleet Captain and one other club representative. Help ensure the success of your activation plan. On-going support to club members from LaserPerformance on equipment maintenance, repair advice and purchase advice. A resource pack, which includes advice on how to develop and deliver a development plan, how to access funding for your club and reclaim boats that may have been abandoned on your club’s premises. On top of this a large part of the success of schemes in England has come from clubs being aware of what is happening at clubs near to them, knowing who to contact and organizing inter-club events. Interested in getting your Club involved?